The top of the debut conference website currently states “catalyzing a new industry ecosystem to help us live significantly healthier, happier & more meaningful lives”. However there’s no description of what this new industry ecosystem is and yet I believe it’s on the scale of the advent of the web browser, in terms of reach and impact. If I am wrong, then at a minimum it’s on the scale of the advent of app stores. In other words, it’s going to be big and then some. So for this thought snippet, I decided to start to provide some details. So what is this new industry? Quite simply “life navigation”. Data networking and protocols enabled us to share and navigate textual pages, decades ago. 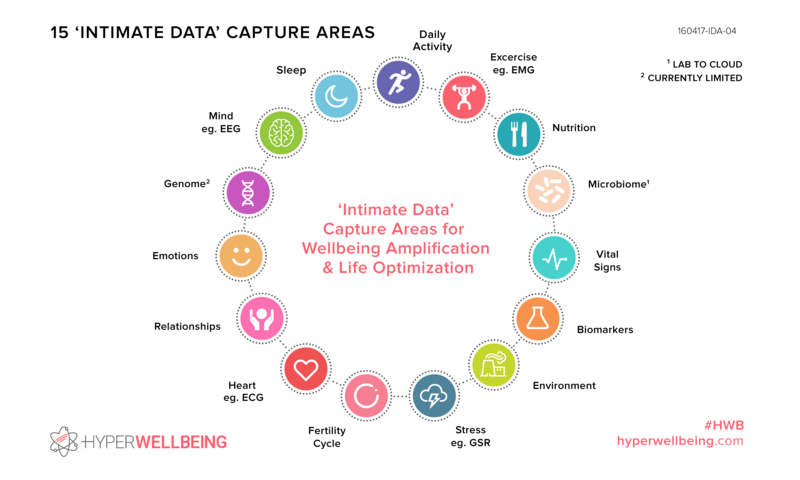 Now wearables, mobile and sensors coupled with the meteoric rise of “intimate data” produced, is starting to enable us to navigate our very own lives, more “efficiently”. If we’re using the Web browser analogy, we’re leaving the Gopher browser phase (circa 1991) and heading towards the Mosaic browser (1993). If we use the app store analogy, we’re at the pre app store iOS jailbreaking stage (2007). So the seeds are already here. It’s already budding and hence the need for a new event and community to nurture it’s blossoming over the coming years. I’m quite certain it’s set to blossom, and as such we’ll see rapid innovation, prolific venture funding, acquisitions, partnerships, an endless spree of startups and everything else that typifies a hot market. As the third computing revolution unfolds – wearable, integrated with sensors, ubiquitous, an extension of our physicality – ever more intimate data is becoming available. It’s a consequence of the human-computer symbiosis underway. If you go back in time, we [IBM] have participated in some of the most glorious moments of history, whether it might have been the first systems that ever did the Census and landing a man on the moon … I’m telling you our moonshot will be the impact we will have on healthcare. It has already started. We will do our part to change the face of healthcare. I am absolutely positive about it … 10% of the information in your lifetime collected about you will be the formal medical records that you know of today, another 20 percent will be the genomics [data] that’s starting to happen. But there is another 70 percent, which people call ‘exogenous data’ that includes what your Fitbit, tracker or Apple Watch [will collect]; it’s what you are eating, what you are filling in. It will be 300 million books per person [of intimate data]. And, with that, you have a whole other world that can mean health and wellness for the individual. The symbiosis and the resulting data is rife for significant negative use, both commercially and politically. So much so that one of the reasons for creating the hyper wellbeing (#HWB) event and community is to foster positive innovation and therefore at a minimum, to provide some form of counter-balance. CEO and co-founder, James Foody, will be speaking. Ayda provides highly accurate insights into your fertility that let you take control. The Ayda wearable adheres smoothly to your underarm to accurately gather data from your body while you sleep. Simply remove at your leisure when you wake to sync your data with the Ayda app. CEO and founder, Sandro Mur, will be speaking. Track your activity, sleep and menstrual cycle. Become a healthier you with the LEAF – the world’s smartest piece of jewelry. …Bellabeat helps create a better, healthier lifestyle by bringing intuitive wellness tools to women, encouraging them to take care of their health and to be informed. CEO and founder, Peter Ohnemus, will be speaking. We measure your health with the Health Score and engage you to actively manage your health in an easy and fun way. The Health Score is a scientifically calculated number from 1 (low) to 1,000 (high) and it is based on who you are (body), how you feel (feelings) and how you live (lifestyle). When tracked over time, it offers a good directional indicator of how your health is evolving. CEO, Carlos Rodarte, will be speaking. We leverage smartphones, wearables, and IoT to capture millions of behavioral data points that range from physical activity and technology usage patterns to rates of speech. …We measure behavioral rhythms in a continuous, non­intrusive way that leads to early detection of changes in health status. …HealthRhythms? was founded by a unique team of mental health care pioneers and information scientists at the forefront of health sensing. CTO and co-founder, Khan Siddiqui, will be speaking. Higi Stations are conveniently located in retail pharmacies and grocery stores in your neighborhood. Visit one to get your higi Score and kickstart your higi adventure. Knowing your numbers is the first step to improving them. Easily track trends and changes in your body stats you receive at a higi Station. Download the iPhone app to follow your higi Score, view your latest check-in results and track down the higi Station nearest you. CEO, Alistair Wickens, will be speaking. Understand how your daily lifestyle choices affect your risk of developing any of the five biggest preventable diseases in the developed world – then set your personal health plan and let Quealth coach you to a healthier life. Our smart coaching system understands you and where you want to get to with your health. Ashwin Pushpala, CEO and co-founder, Sano, will be speaking. We are helping people understand what’s happening inside their bodies. With our patented silicon biometric sensor and software platform, people can continuously monitor important markers in their bodies’ chemistry so they can make thoughtful choices about the way they eat, move, and live. …we are helping people confidently establish healthy patterns by giving them the power to know what their bodies need throughout the day. Mylea Charvat, CEO and founder, Savonix, will be speaking. Digital neuroscience can dramatically improve the quality of our lives, our organizations and our communities. The Savonix Assessment evaluates all core domains of cognition, and delivers a clinically valid, evidence-based result in just 30 minutes all from your smart phone or tablet. …Savonix delivers personalized results and recommendations to help you improve in areas such as emotion and mood regulation, executive function, focus, working memory and more. CEO and co-founder, Jonathan Palley, will be speaking. Spire helps you to discover when you’re stressed, where it happens, and what you were doing. People around the world are using Spire to reconnect with their body, get more done at work, and sleep better at night. …Spire uses research from Stanford’s Calming Technologies lab to understand your state of mind. CEO and founder, Victor Chapela, will be speaking. Genes are not fixed, they have “switches” that turn on and off by things like life experiences and environmental influences and can trigger disease… Precision medicine might bring us closer to addressing diseases like cancer and diabetes. Personalized solutions are needed to keep us healthier. We combine methodologies that have proven effective at a general population level, with your health data and the latest scientific research. With a chat-like interface the Suggestic app is available 24×7 to guide you towards a healthier life. CEO, Martín Blinder, will be speaking. The data we need to inform the right lifestyle choices is all around us and our technology is transforming the way individuals and organizations handle healthcare challenges. …data science driven approach is focused on impacting user behavior by empowering individuals to take greater control of their health. CEO, Mirza Cifric, will be speaking. …From health conditions to lifestyle traits, your genetic make-up offers specific and actionable insights into your health, insight you can use every day to live better. …the first company in medical history to offer individuals the opportunity to easily and affordably unlock the secrets of their entire genome. To know what truly, scientifically makes us tick, and to be able to put this knowledge to work each and every day. How to best eat, sleep, exercise, and take care of ourselves. …Veritas myGenome gives you genetic insights about unique personal traits that, for example, could lead to a better workout, perhaps help you with your diet and the foods you love, or result in a more personalized approach to skin care that is just for you. myGenome specifically examines five categories of lifestyle traits, including athleticism, nutrition, longevity/aging, ancestry, and many other non-clinical characteristics. myGenome includes the following lifestyle traits and genes. CTO and Executive Director, Visit Thaveep, will be speaking. Being is an advanced wearable that provides health and stress insights for more mindful living… continuously monitors your health with intelligent mapping capabilities of your moods, activity and sleep. …fitness score is personalized via data from your heart rate, blood oxygen level, and respiratory rate, in relation to your gender and age group. …algorithm uses the measurement of your heart rate variability to determine your level of stress. Looking slightly forwards, a prototypical example of what’s to come could be a current crowdfunding campaign dubbed Shae – The World’s Most Advanced Virtual Health Assistant. As of writing, it’s passed it’s 100K USD goal by 40% and still has 18 days left. …eliminate the confusion around health. Making health simple, and convenient. No more shot in the dark solutions for your nutrition, exercise and even lifestyle needs. No need for trying to keep up with the latest information, or even having to plan or remember healthy choices. …provides a customized experience based on your specific epigenetic make up that can actually change your health, in real-time. …more than 10,000 data points and 500 algorithms to create an evidence-based, scientific solution 15 layers deep – giving you the answers for your diet, lifestyle and happiness, based specifically on your epigenetic make up… we discovered a way for you to turn off your bad genes and turn on your good genes, in everyday life. …uses complex algorithms to translate the distinct relationship between your body’s shape and physical traits with it’s physical functions, hormone secretion, metabolism and lifestyle preferences. …uses anthropometry (scientific assessment of your body’s ratios), family history, and assessment of your lifestyle and environment to determine your phenotypic and epigenetic profile. …Did you know that endocrinology, anthropometry, phenotypology, biotypology and neuropsychology are some of the basic layers that actually make up your body? Shae does, so you don’t have to. The founders are next to be invited to participate this fall. Please do help spread the word of this event and community. As I said at the start it represents an opportunity and shift which at minimum is on the scale of the advent of app stores. Moreover, it has boundless potential for good.